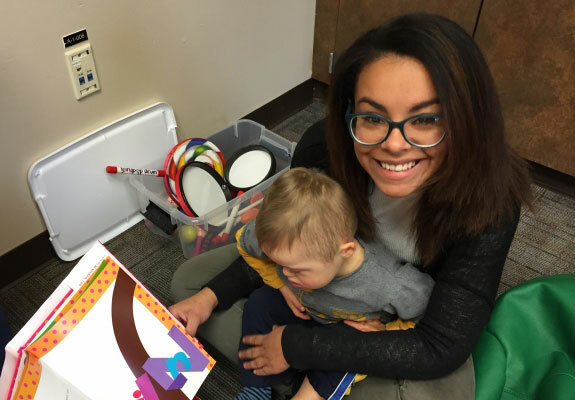 Krystal began her Vista journey on January 30, 2017, as a Behavior Technician in a high school classroom. With a Bachelor’s Degree from Penn State and previous experience as a Habitation Aide for a Vista student for two and a half years, Krystal was a perfect Vista fit! On November 6, 2017, Krystal received an opportunity to transfer to the Early Intervention Program as a Registered Behavior Technician. Krystal went on to share that the students have a direct impact on her life. She cherishes every moment she has with her students, because it creates a stronger bond between them. What has being a part of the startup of Early Intervention been like? Early Intervention utilizes a student-led instructional model. Staff incorporates the learning goal into an activity that the student prefers. For example, if a student enjoys blowing bubbles, Krystal may incorporate stomping on the bubbles to encourage the student to imitate motor movement.